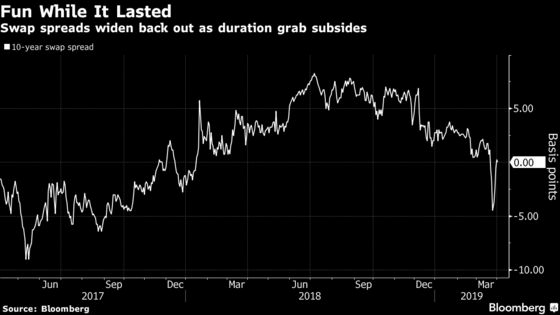 (Bloomberg) -- Investors in mortgage-backed securities are cooling on swaps used to hedge against falling interest rates, signaling confidence that yields may have found their bottom. Duration: the weighted average maturity of the security’s cash flows, where the present values of the cash flows serve as the weights. The greater the duration of a security, the greater its percentage price volatility. There are other methods for mortgage investors to add duration, such as buying lower-coupon TBA for their higher duration profile. “Mortgages were pushed a bit too hard through this rally as 3 and 3.5 percent TBA traded in their ‘hedging vehicle’ status for ‘convexity proxies’ in a mad duration grab,” said Russell Middleton, a director on the agency MBS desk at MUFG Securities Americas, Inc.
One thing to keep an eye on is a 4 percent level on the 30-year mortgage rate, according to Schmidt, “due to the big gross weighted-average-coupon buckets between 4.40 and 4.60 percent in outstanding 30-year mortgages.” A drop in the 30-year mortgage rate below 4 percent could reignite a grab for duration.